Good Morning Kitchen Fam! It's FRI-YAY and you know that means...PIZZA!!! Growing up, there were two things that always happened on Friday. One, we would order pizza, and two, we would go to Blockbuster and rent movies. Isn't it funny how the most inconsequential things from your childhood become some of your fondest memories? Anyway, as I've gotten older, I long for those simplistic traditions in my life. Therefore, I've been trying to bring Pizza Friday back! However, since I'm a food blogger, I like to shake things up a bit and that's exactly what I did here with my Reuben Naan Bread Pizza. For this recipe I cooked my corned beef in my crockpot. Once it was finished cooking, I shredded it. I decided to go with shredded because I thought the ends would get nice and crispy as the pizza bakes in the oven. If you don't have leftover corned beef, and don't want to make any, you can TOTALLY use deli meat for this. Just chop it up! Now you will need to preheat your oven to 425 degrees. Place your naan bread on a baking sheet. I'm using whole wheat naan bread here, but any kind of naan that you love will work fine. I LOVE using naan for my pizza, but if you would rather have a traditional crust, I have a fantastic recipe for that (HERE). After that I spread the thousand island onto the naan bread for the "sauce". I sprinkled my corned beef all over the naan. On top of the corned beed I sprinkled the sauerkraut over everything. Then I added a couple slices of Swiss cheese on top. Place your Reuben Naan Bread Pizzas in the preheated oven. and bake for 10 minutes. I love how the naan bread creates the perfect sized personal pizza. Not only that, but it's delightfully crisp AND chewy! Now it's time to take a bite! Y'all!!! Y'ALL!!! 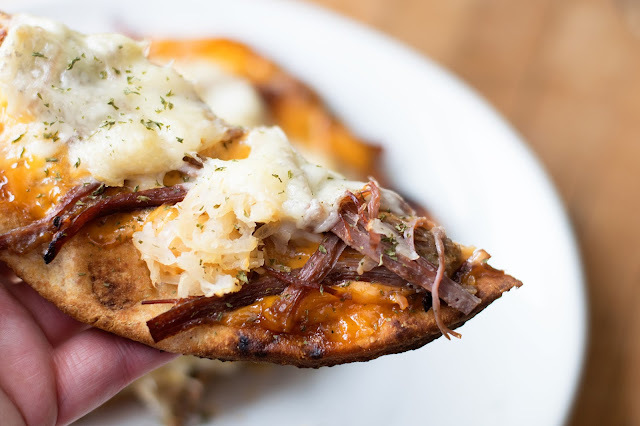 This Reuben Naan Bread Pizza is SO GOOD!!! 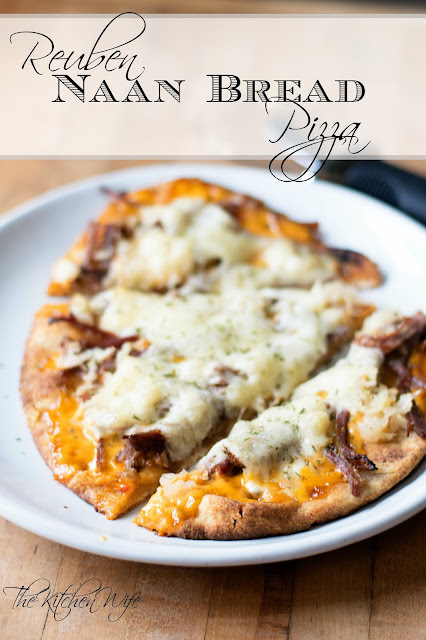 You get all of those great flavors from a Reuben sandwich, but still the fun and convenience of a pizza. And would you look at all those crispy bits of corned beef! Oh my word, I could eat this all day everyday! If I had to change one thing, I would have laid the cheese on the bottom, then the beef, then the kraut, AND THEN drizzled the sauce on top. The dressing didn't cling to the bread so all of my topping kept sliding off. 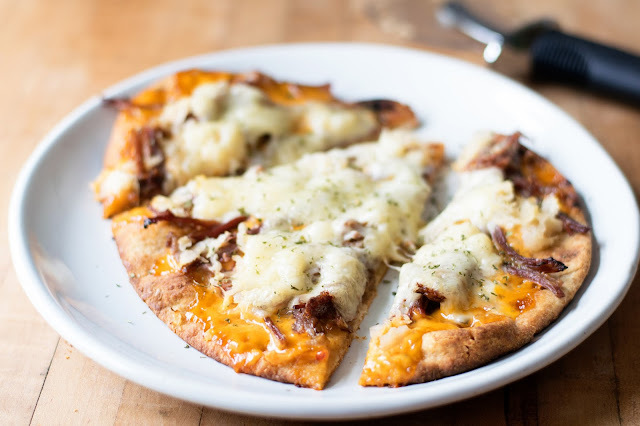 lol Anyway, no matter how you assemble it, I know you're going to love this Reuben Naan Bread Pizza Recipe, so get in the kitchen and make it TONIGHT! Also, I would love to hear what some of your favorite pizza combos are, so leave them in the comments down below! Place the naan breads on a baking sheet. Spread the dressing over the naan bread like a "sauce". Sprinkle the corned beef over the bread. Sprinkle the sauerkraut over everything. Place the cheese over everything. Place into the oven and bake for 10 minutes.